What a strange eventful life has mine been, from a poor little player child, with just food and clothes to cover me, dependent on a very precarious profession, without talent or a friend in the world - first the wife of the best, the most perfect being that ever breathed ...and now the wife of a Duke! You must write my life... my true history written by the author of Waverley"
The passage above was written in 1827 by the Duchess of St. Albans to Sir Walter Scott shortly after her marriage to the 9th Duke of St. Albans, a man 23 years her junior. How did a 50-year-old former actress attract so lofty a peer? It’s a good guess that her enormous fortune dazzled him. How, then, did an actress at a minor London theatre become one of the wealthiest women in the British Isles? Harriet Mellon (1777-1837) was nearing forty when she attracted the attention of the enormously wealthy banker Thomas Coutts (1735-1822) while acting at the Duke Street Theatre. She was noted for her beauty and was painted by George Romney and Sir Thomas Lawrence. 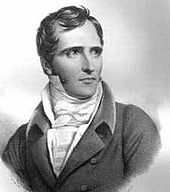 Coutts married her soon after his first wife died in 1815. This husband whom she described as “the most perfect being that ever breathed” was eighty. Coutts had founded Coutts & Co., the royal bank, and he enjoyed close relationships with the highest ranking families and officials in the land. Both his first wife, Elizabeth Starkey, formerly in service at his brother’s house, and Harriet would have been considered beneath him, but such lack of consequence was apparently not of significance. His three daughters—with encouragement from their father—were more cognizant of rank when selecting their mates. His eldest daughter, Susan, married the 3rd Earl of Guilford; daughter Frances married the 1st Marquess of Bute; and Sophia married Sir Francis Burdett. When Coutts died seven years after marrying Harriet, he left his entire fortune to her. She hosted parties at her townhouse at 78 Piccadilly, her lodge four miles away in Highgate, and her place in Brighton. Five years after she was widowed, she married the Duke of St. Albans. 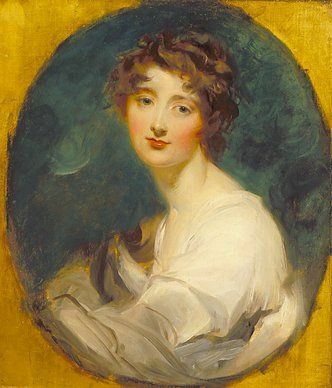 When she died ten years later, she left the bulk of her fortune to a granddaughter of her first husband, the youngest daughter of Sir Francis Burdett. Harriet paid homage to her first husband in stipulating that her heiress adopt the name Angela Burdett-Coutts.—Cheryl Bolen, whose Oh What a (Wedding) Night releases in April and can be preordered everywhere now. 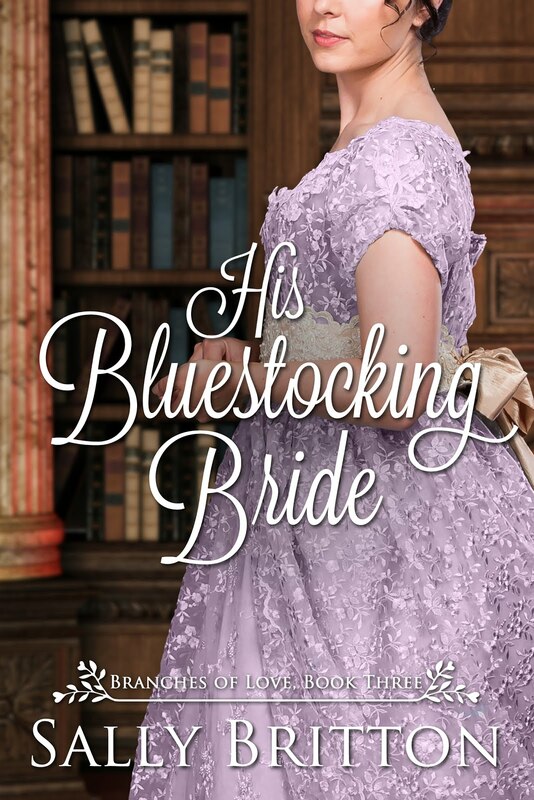 It’s Book 3 in the Brazen Brides series. 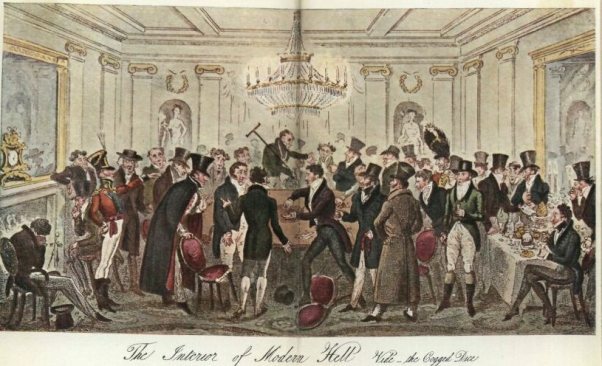 Almost all Regency gentlemen gambled, drank, played hard, hunted, went shooting and generally indulged in excess, carnal and otherwise, following a tone set very much by the Regent. The Prince turned 49 in 1811 when he became Regent of England, putting him past the age where either “young” or “blade” could be aptly applied to him, but there were other men gentle by birth—though not necessarily by manner—who looked to belong to certain distinct fashionable sets which excelled in specific areas. It can be difficult to tell the difference between these different set, and quite often a gentleman had overlapping interests. There were rakes who were good enough sportsmen to be called “Corinthians,” and Corinthians who also belonged to the dandy set by virtue of the care they took with their dress. Lord “Beau” Petersham was one such man. 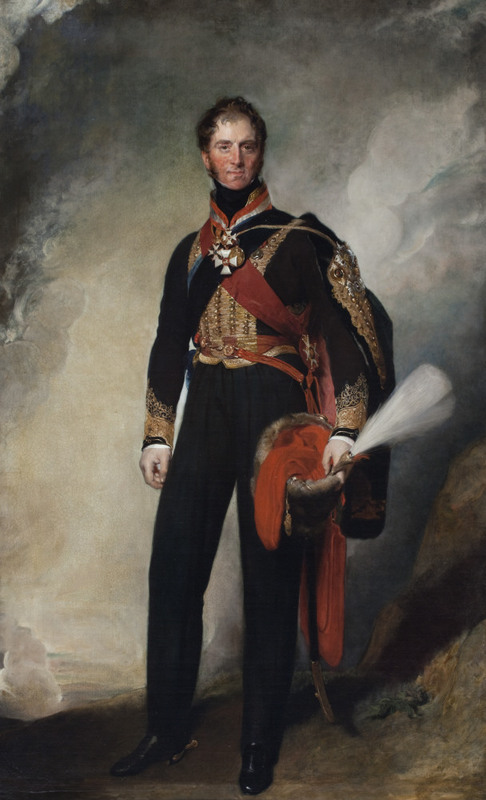 Born in 1780, Charles Stanhope, Viscount Petersham, later became the Earl of Harrington in 1829. He was said to resemble Henry IV, and he emphasized this by growing a small, pointed beard. He designed his own clothes and made famous the Petersham overcoat and the Harrington hat. He was also noted for his brown coach, clothing, and servant's livery—a color said to have been chosen for his devotion to a widow named Brown. However, in 1831 he married a Covent Garden actress named Maria Foote who was seventeen-years his junior. His was also noted for his snuff and tea mixes, and Gronow said of his sitting-room that, "...all round the walls were shelves, upon which were placed tea-canisters, containing Congou, Pekoe, Souchong, Bohea, Gunpowder, Russian, and many other teas, all the best o the kind; on the other side of the room were beautiful jars, with names in gilt letters, o finnumerable kinds of snuff...."
Petersham owned a snuff boxes for each day of the year and according to Priestley in The Prince of Pleasure, took care to "...choose one that suited the weather, not risking a cold by using a light snuffbox in an East wind." 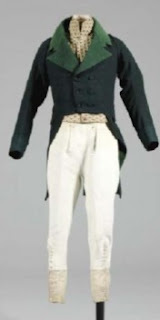 Lords Alvanley and Sefton were other examples of dandies who also had sporting interests. William Arderne, Baron Alvanley, was famous for his wit, his dinner parities, his dress and his eccentricities. He insisted that an apricot tart be on the sideboard, no matter the time of year, after he was served a cold one that he liked. He also put out his candle by throwing it across the room—with his valet wisely remained alert in case it should start a fire and have to be put out. A hard rider to hounds, Alvanley was one of the best liked men of his set. Lord Sefton, William Philip Molyneux, was a cousin to Petersham. Society wits dubbed him “Lord Dashalong” for his driving style, and his matched bays were quite famous. He rode in steeplechases and was so fond of coursing greyhounds against each other as a sport that he devoted part of his estate to raising rabbits for the chase. Even with examples of gentlemen who had diverse interests, there are still distinctions that can be made between these various sets. Byron is quoted as having said, "I like the Dandies, they were always very civil to me." This shows that while the distinctions between these sets were fine, they existed. In Life in Regency and Early Victorian Times, Chancellor marks the world of the dandies as "...that portion of St. James's, bounded by Piccadilly and Pall Mall, St. James's Street and Waterloo Place, was the ne plus ultra of fashionable life..." Obviously with a mention of Waterloo Place, this puts this area a touch later than the Regency, but St. James's did mark the center of the fashionable gentleman's world. Wit was as much a hallmark of the dandy as were his clothes—indeed, everything about the dandy had to bespeak style, including his dress, his manners, and his furniture. Understated elegance was what Brummell strove for and he is quoted as saying, "If John Bull turns round to look after you, you are not well dressed; but either too stiff, too tight, or too fashionable." 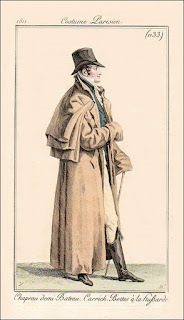 As a gentleman, Brummell rode to hounds, following that sporting fashion. But it is reported that he never rode past the first field for he did not want to stain his white boot tops with mud, and so retired to the nearest inn. This is what sets him as a true dandy, caring more for his appearance than anything. A true Corinthian would have distained such a poor showing, for, in general, Corinthians sought to excel in the sporting world. A lad of mettle was what the Regency Corinthian sought to prove himself. The Corinthian was, above all, a sporting man. He drove his own horses, boxed, ride to hounds, shot and strove to be among the elite of this group would undertook these expensive as well as athletic endeavors. Military men, too, might aspire to sporting excellence. Wellington was said to have a “bad seat” on a horse, but he certainly loved to hunt. His officers could keep packs of hounds, and while foxes might be scarce in Spain and Portugal, there were rabbits enough to hunt. Winter was also the time when the army had to wait out the winter before a spring campaign, and as Harry Smith wrote in his autobiography, “At this period of the year (February, March) the coursing in this part of Spain is capital, and by help of my celebrated dog Moro and two other excellent ones, I supplied the officers' mess of every Company with hares for soup.” Smith kept greyhounds to chase the hares, a sport far older than fox hunting, and his life is superbly fictionalized in Georgette Heyer’s The Spanish Bride. There were more than a few Corinthians who also excelled at excessive dissipation, and who could be called rake, or “rake-hell,” or “rake shame.” It took more than a little womanizing for a Regency gentleman to earn the status of rake. Prostitutes were so numerous that guidebooks were put out to describe the women, their specialties, and what they might not do. Most gentlemen kept a mistress, and even titled married women considered discreet affairs the norm. But a gentleman who went beyond conventions, who preyed upon young women, or even children, or who undertook perversions, was deemed unacceptable. These rakes ignored convention and morality. Two such examples of this are Lord Barrymore and the Duke of Queensberry. Born in 1768, Richard Barry became the Earl of Barrymore in 1773. He took to living to please himself, and earned the nickname “Hellgate.” His brother, Henry Barry, became "Cripplegate" for his crippled foot, and his other brother, the Honorable Reverend Augustus Barry, was called “Newgate” because that was the one gaol he had kept clear of. His sister, who became Lady Milfort, was called "Billingsgate" for the foul language she used. Barrymore rode his own horses in races, then went deeply into debt building his racing stables and gambling on his horses. It is said that he was a whip equal in skill to any professional coachman. He also organized boxing matches, bet on them, and was accounted a good boxer himself. In 1792 he married Miss Goulding, niece of the notorious Sir John Lady and Letty Lade—a woman who had been the mistress of the highwayman known as "Sixteen String Jack." Sir John was not a respectable person, but he was a noted whip, and had driven a coach and four round the tiny horse sale yard at Tattersalls—a remarkable feat. Instead of marrying to settle down, Barrymore had to make a scandal of even this. 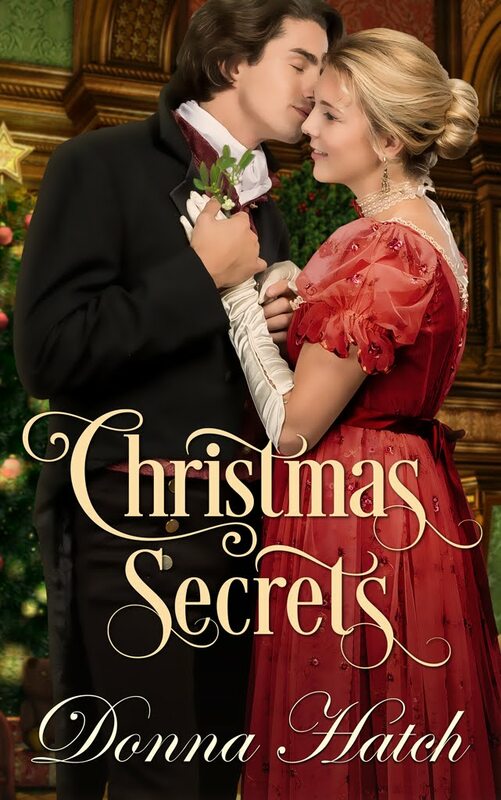 He received permission from Sir John to marry Lade’s niece, but Barrymore decided to elope with his bride anyway, setting Society to talking about such disgraceful behavior. While Lord Barrymore lived up to the image of a dissolute and dashing young blade, the Duke of Queensberry, known as "Old Q" for the initial he had painted on his carriage instead of his crest, was more the classic old rake. He also was a noted race-horse owner, gambler and driver, traits of a true Corinthian. William Douglas had become the Earl of March in 1731, and then inherited the dukedom of Queensberry in 1786 when his cousin died. Fabulously wealthy, he never married. He adored young Italian opera singers, and was said to have been a member of the notorious “Hellfire Club.” Like a true rake, he neglected his estates of Drumlanrig, Dumfries, and Galloway, and lived for his own pleasure. While Georgian, the Hellfire Club is worth a brief mention in that gossip made it a standard (abet a low one) for scandalous debauchery. It was not actually called the Hellfire Club by its members. Started in 1746 by Sir Francis Dashwood, its name, like its members and its activities, were kept secret. It was called either The Friars of St Francis of Wycombe, The Monks of Medmenham, The Order of Knights of West Wycombe, or The Order of the Knights of St Francis. Stories held that members included the Earl of Sandwich, the son of the Archbishop of Canterbury, William Hogarth, the Earl of Bute, the Marquis of Granby, and even the Prince of Wales, and that they indulged in everything from orgies to Satan worship. What they really did is unknown, but it is very likely that they held orgies with prostitutes and probably performed invented Pagan ceremonies that were relatively harmless. By the Regency, Dashwood and his club had been replaced by other clubs—some every bit as scandalous. 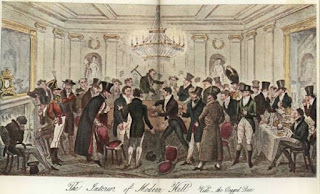 There were numerous gentlemen’s clubs in Regency London, and a gentleman’s clubs also denoted his status within each set. Some clubs were founded for the purpose of eating, some for drinking, some for wit and society, some for debauchery, some for gambling, some for sports. Many of them had whimsical rules, such as a club founded by Lord Barrymore which ruled that "if any member has more sense than another he be kicked out of the club." Most gentlemen belonged to several clubs. Waiter’s was considered the domain of the dandy, but closed in 1819 after becoming infamous as a place where too many gentlemen were ruined with deep play (which was also suspected of being rigged play). White’s was considered the most exclusive, and was where Beau Brummell held court in the famous bow-window with Lord Alvanely, the Duke of Argyle, Lord Worcester, Lord Foley and Lord Sefton. Opposite White’s stood Brooks’s, a club that, through its patronage by Whig families, became known as the place for liberals. Members included the radical and the artistic, such as Edmund Burke, Sir Joshua Reynolds, David Garrick, Horace Walpole, Edward Gibbon, Richard Sheridan, and the Prince of Wales. Finally, a sporting minded gentleman might join Boodle’s with its focus on heavy gambling, or The Marylebone Cricket Club which played at Lord’s, or might aspire to the Bensington Driving Club, founded in 1807, or the more elite Four-Horse Club. The Four-Horse club met in George Street, Hanover Square, and drove to Salt Hill to dine. Members had be noted whips, drove four horses attached to a barouche carriage and had the right to wear the yellow-striped blue waistcoat and black spotted neckerchief insignia of the club. Membership was so exclusive that the club counted only around thirty members or so, and included Lords Barrymore, Sefton, Worcester and Fitzhardinge, Sir John Lade, Sir Henry Peyton, Sir Bellingham Graham as well as other noted whips. M. Simond, writing about his visit to England in 1810, might well have been writing of the Four-Horse club when he said, "I have just seen the originals of which Matthews gave us a faithful copy a few days ago in Hit or Miss—the very barouche club; the gentlemen-coachmen, with half-a-dozen great coats about them—immense capes—a large nosegay at the button-hole—high mounted on an elevated seat with squared elbows—a prodigious whip—beautiful horses, four in hand, drive in a file to Salthill, a place about twenty miles from London, and return, stopping on the way at the several public houses and gin shops where stage-coachmen are in the habit of stopping for a dram, and for parcels and passengers; the whole in strict imitation of their models and making use, as much as they can, of their energetic professional idiom." For boxing, there was Daffy's Club, which The London Spy reported was held at Tom Belcher's at the Castle Tavern in Holborn. Boxing matches were also held at Fives Court in St. Martin's Street. Just as each set had its customary haunts and clubs, slang terms also defined a gentleman’s interests. Some dandies, such as Sir Lumley “Skiffy” Skeffington spoke with a lisp. (Many in the liberal Devonshire set also copied the Duchess of Devonshire’s lisp to denote their status as Whigs.) With his lisp and his appearance as “a thin pallid little man with sharp features and rouged cheeks, and the atmosphere of a perfume shop," Skeffington was almost the archetype of a dandy. He wore colored satin suits, penned plays and was said to spend eight hundred pounds a year on his clothes. 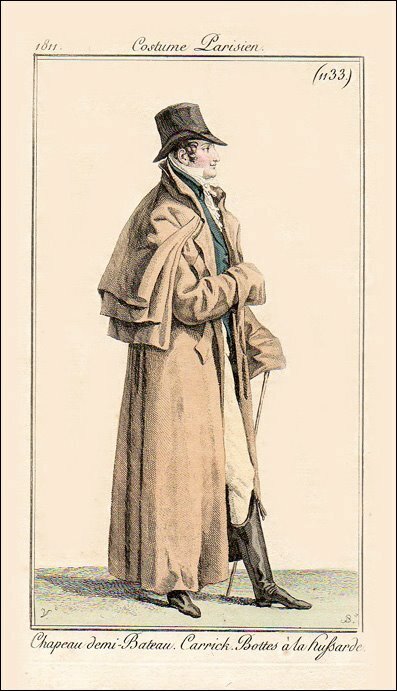 Actually, while Skeffington was a friend of Brummell's and the Regent, he was actually too fashionable to meet Brummell's standards for understated taste. The Corinthian, in turn, adopted boxing terms or the slang of the coachman on the road. It should be noted that are differences between London “thieves cant” often used by the young bucks about town, and the language of the Fancy. As examples, Pierce Egan's Life in London; or, The Day and Night Scenes of Jerry Hawthorn, Esq., and his elegant friend, Corinthian Tom, accompanied by Bob Logic, the Oxonian, in their Rambles and Sprees through the Metropolis shows his heroes—Tom and Jerry—using the slang of the Fancy as Tom shows his country cousin Jerry about town. Egan calls his hero "one of the fancy, but not a fancy man...” And said of him that while he was as home waltzing at Almacks, he was not a dandy. Egan also published Boxiana as a serial put out between 1811 and 1813, and he was a well known figure in the sporting world. Captain Grose’s Dictionary of the Vulgar Tongue provides a reference to the thieves cant used by the London underworld, and which might be employed by a young gentleman going slumming in brothels or gaming hells. In addition to imitating the lower classes of London, young gentlemen looked to imitate the professional coach driver who handled the mail and stage coaches. They might done a “Benjamin” (the greatcoat worn by coachmen) while seeking to “handle the ribbons” (hold the reins), and “spring the team” (put a team into a canter); “feather it” (drive very close to obstacles), managing both the “leaders” and the “wheelers” (the front pair and rear pair of a four horse team) over a “stage” (the distance between one change of teams and the next—usually 10 to 20 miles). For others, it was not the professional coachman but the professional boxer who became the hero to emulate. 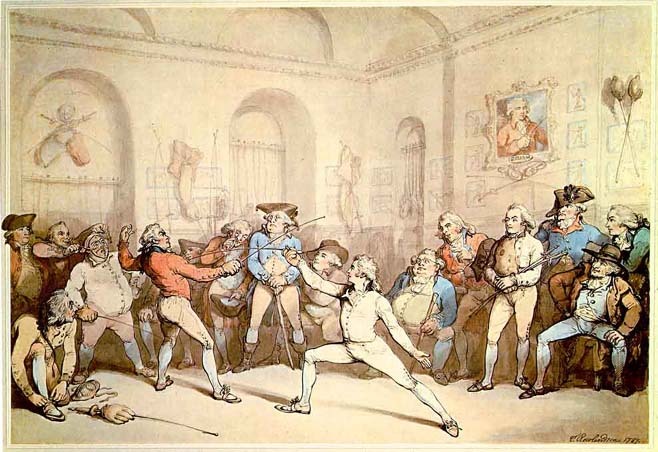 Fist fighting begun to replace sword or cudgel sports during George I’s reign. Though it was illegal, betting made it enough of an attraction to draw nobility as well as common folks. The first official champion of England was James Figg, who was also an expert swordsman and who later opened a School of Arms. Broughton’s rules outlawed hitting below the belt, striking an opponent who was down (which included being on his knees). Wrestling holds were allowed only above the waist. Every fighter had a gentleman to act as umpire, with a third to referee disagreements. When a fighter was knocked down, he had 30 seconds to get up—or have help getting up—and then he had to be placed at the corner of a 3-foot square that was drawn in the center of the ring. 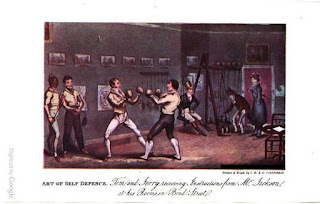 As was common for retiring champion boxers, when John Jackson retired after willing the champion title in 1795, he opened the Bond Street School of Arms at Number 13. Jackson won the championship in a hard-fought match with Daniel Mendoza, but it was his school which brought him fame. Jackson, known as “The Gentleman,” was friends with fencing instructor Henry Angleo, who had a school next door and who urged his students to alternate with lessons from Jackson—which made sense for Jackson advocated footwork and the science of targeting a hit. Everyone went to Jackson’s, even Lord Byron, the lame poet. When tasked with keeping such low company Byron insisted that Jackson’s manners were “infinitely superior to those of the fellows of the college whom I meet at the high table.” That no doubt contributed Jackson’s nickname and his success. Other boxing champions of the Regency era included: Jack Bartholomew, champion from 1797 to 1800. Jem Belcher who often wore a blue scarf marked with white spots and blue centers around his neck, which became known as the Belcher neckcloth, and soon sporting mad young bucks were wearing any scarf of garish color with spots. “Hen” Pearce, “The Game Chicken,” who held the title from 1803 to 1806 when he retired. John Gully who won the championship in 1807 and retired in 1808 to open a racing stable. 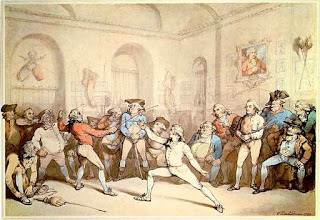 And Tom Cribb became the champion in 1808, winning a famous bout against African-American Tom Molineaux on December 18, 1810. Cribb went on to hold the champion title until 1822. As an interesting footnote, Tom’s less famous brother, George had about five fights, and lost all of them—some men simply were not cut out to be Corinthians, dandies, or rakes.